Ask About Our $20.09 Full Body Swedish Special ! Please allow me to introduce myself. My name is Greg Sawyer, and I have been professionally massaging people and their tired aching backs & necks for the last 12 years. My goal on this website is to educate you about the value of professional therapy. Then… and only then if you think it makes sense for us to talk…I would love to sit down and offer you a 100% FREE complimentary consultation. We can talk about your stresses, backaches, pains & concerns to see which therapy would make the most sense for your particular situation. So then lets begin your education. What Is Lymphatic Massage Therapy? Science has proven over and over again the therapeutic value of the massaging on a tired and stressed out body. Read on to learn about the benefits of massaging those aching muscles. Do you know exactly what your lymphatic system is and what it does in your body? Read on to find out about the benefits of lymphatic drainage. What is the Neuromuscular approach to back pain and why should you consider it as a regular part of your ongoing health maintenance routine? Read on to learn about the benefits of Neuromuscular Therapy. 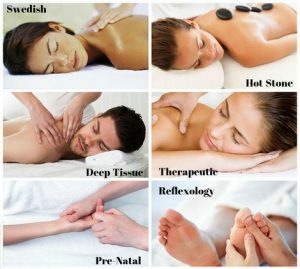 Yes it is true, thousands of expecting mothers have seen the value of Pre-natal massaging services to relieve their aching back & those swollen legs and ankles. Read on to find out about Prenatal Massging Therapy and how to throw a Baby Shower for a mommy you care about that she will never forget! Are you an athlete, in training or are you just trying to get back in shape? You would be suprised how much sports therapy can help those tired, strained and injured muscles and tendons. Lets face it… Massage-schools across the United States are graduating new therapists each and every day. Of course, every massage spa ttherapy facility says they are the “best”. I could go on to tell you about myself as well. Instead find out what our happy clients say about how our services have helped them personally. Where Do Therapists Go For A Good Rub Down? It only makes to find out where a NMT goes when his back hurts. It just might help you in making your own decision when your back is aching. Finally– If and only if, you think it makes sense to talk about your situation…please feel free to contact me regarding our 100% RISK FREE consultation.